Supplied: In three litre containers of peat-free compost, healthy and well established, approximately 1 - 1.2m (4 feet) high, with full planting and aftercare instructions. The tallest living plant on earth, Sequoia sempervirens was first discovered in the Californian coastal mountain ranges in the 1790's. Although heavily forested for their timber there are still giants standing in excess of 100m (350 feet). Here in the UK in the 150 years from they were first introduced specimens are approaching a more modest 50m high. These giants of the horticultural world are exceptionally long lived with many reportedly in excess of 2000 years old. 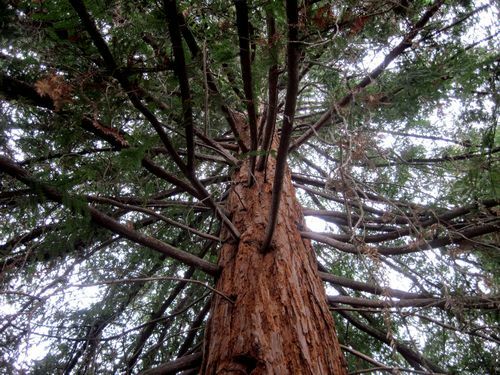 An established Califorian Redwood truely is a remarkable sight. Massive spongy, tanned red / brown trunks appear to rise for ever before being surrounded by fresh green, yew like foliage. Ironically the world's tallest tree is also regularly used as a bonsai subject. This easy to grown redwood is frost hardy and fine for UK conditions. Clearly they need sufficient space to grow, they also enjoy a moist soil especially until they get established.